#stampinup #faithfulinkspirations Today I'm sharing the second of three cards we'll be making during the September session of my annual Christmas card-making class. I really enjoy this class--it's one of the highlights of my Stampin' Up year. 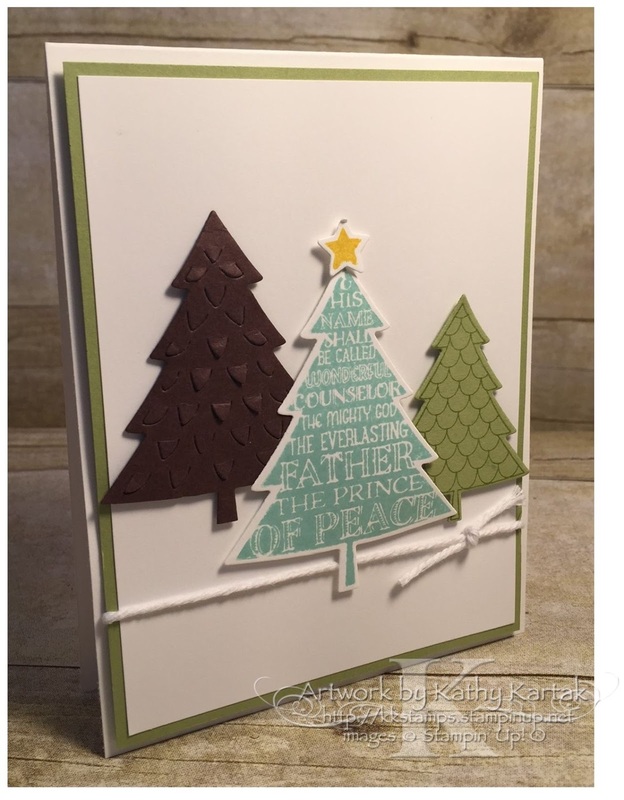 This card uses the "Peaceful Pines" stamp set and coordinating "Perfect Pines" Framelits. And it's another clean and simple design, which I love. I started by making the Christmas trees. I cut out the Chocolate Chip tree on the left using the framelits. First I cut out the tree with the medium tree outline, then I laid the textured framelit on top and ran it through the Big Shot a second time. I used my Bone Folder to poke out the triangles from the back side of the tree. For the tree on the left, I stamped the scallop tree in Pear Pizzaz ink onto Pear Pizzazz card stock and cut it out with the small tree framelit. For the center tree, I stamped the "Hallelujah Chorus" tree in Pool Party onto Whisper White and cut it out with the largest tree outline framelit. I stamped the star in Crushed Curry and cut it out with the matching Framelit. To assemble the card, I started with a Whisper White panel and adhered each of the trees to it using Stampin' Dimensionals. I cut a teeny, tiny piece of Stampin' Dimensionals to squeeze behind the star, too. I wrapped a length of Whisper White Thick Baker's twine just under the tree trunks before adhering this panel to a Pear Pizzazz mat. I used Stampin' Dimensionals to adhere the assembled piece to a Thick Whisper White card base, cut lengthwise. I'm torn: Does this card need a sentiment? Or is the "Hallelujah Chorus" on the tree enough? COMING SOON! Do you wish you could come to one of my Christmas card-making classes but live too far away? Well, soon I'll be posting details on FOUR ways you can attend virtually! I still have a few technical details to work out in the background, but watch this space for exciting news in about a week!